It's the dream of many dads: being able to spend more time with their children. And right from the start, pressure on families is not helped if it's only possible to take a short paternity leave. In 2017, Aviva, which at the time was the UK's largest insurer, started to let all new parents have the same amount of paid leave. In the UK, 496 Aviva employees used the policy in the first 10.5 months - 268 female, and 228 male workers. Piers says that being able to take the chunk of paid paternity leave didn't exactly bind him to the firm, but had made him want to give back. Mairéad Nayager, chief HR officer at Diageo said: "True gender equality in the working world requires fundamental changes to a broad range of working practices, including a shake-up of the policies and cultural norms around parental leave. 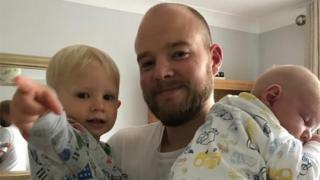 HR professional body the CIPD said some employers "recognise the need for greater balance when it comes to parenting and are increasing paternity leave and pay as a result". Claire McCartney, CIPD diversity and inclusion adviser, said: "Parental leave is a key way of supporting parents in the workplace. It can help them to establish a strong relationship with their children and gives them time to set up childcare systems that work for them going forward." "With a tight labour market, employers also know they need to stand out from the crowd," she said. "Those organisations that offer attractive parental leave and pay policies will be more desirable to working parents who represent a high proportion of the workforce." While many small firms were sympathetic to the needs of parents, and were encouraging flexible working, they were also dealing with other pressures and costs, such as this week's introduction of the HMRC Making Tax Digital scheme, the spokesperson said.